First, cut the pomegranate in half and fill a bowl with water. Inside the water, remove the seeds and the white membrane. Once you remove all the seeds from the shell, the seeds are going to fall to the bottom of the bowl and the white membrane is going to float. Skim the white membrane with a small stainer or slotted spoon. Then, strain the water out from the seeds. Enjoy your mess-free pomegranate and also save money by not having to buy those expensive pre-seeded pomegranates! 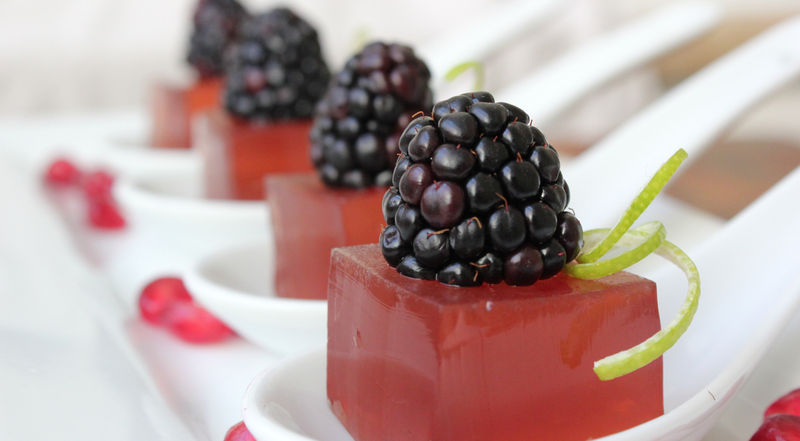 Now, you can make many recipes like this delicious Champagne Pomegranate Jelly Shots! Thanks! That is very true!! That is a sound strategy. Thanks for reading! Great tips — never knew how easy it was to work with pomegranates and I love them! Happy New Year! BTW, I love your kitchen backsplash! You are toooo kind…thank you! I shall take a note of this. Thank you for sharing this blog. Say, I’m curious how did you find me? Thanks! To be honest, I can’t remember, but I dig the whole cyberpunk theme! Such a great tip. I’ve been guilty of trying to peel one at work, albeit ungracefully. Took me forever too! ugh I’m with you on loving pomegranate, but not so much the task of actually getting the seeds out. I’m definitely going to have to try out this method! Fantastic! It is very unique the champagne pomegranate jelly! Lovely way to get to the root of the matter. We have a crazy tv programme here called ‘Come dine with me’. I caught a bit yesterday; one of the ‘contestants’ showed what seemed to be a very simple way of getting the seeds from a pomegranate; he just cut it in half, inverted over a bowl and bashed the skin with a spoon. The seeds, undamaged, just fell into the bowl. I haven’t tried it, I don’t like pomegranate, but it seemed to work very well. Other than this, I don’t like the programme either! That is a good way too, but you might get the membrane in there, which tastes gross. Putting it on water is an extra step, but it gets rid of the membrane. Thanks for reading! Thank you! It definitively makes life easier! Have a great weekend! non non non! You spank them out with a spoon into the water. Ah, I wish I had read this a few days ago—I made a mess of myself and my kitchen! But I did 3 poms so I could get the mess in one swoop and use them for a few days. Great tip! Smart method indeed! Your pictures are lovely! Nice. Thanks for this! Your pictures are gorgeous, by the way! Thank you! I quit buying them because they were so difficult to open. Now I can toss the membrane free seeds in my juicer. Thank you! That is what used to happen to me all the time! Informative. Artistic. What’s not to like? And I’m a Kraft Dinner guy! Nice work. Very cool blog you’ve got. Now following! Oh my gosh, that is genius and so less messy- I’m definitely going to be doing this! Thank you! I too love pomegranate seeds–especially sprinkled over salads. A few nights ago I looked at my face in the bathroom mirror when I was brushing my teeth after dinner and I had red dots everywhere. My husband said nothing. Your method should eliminate this hazard!